This beautiful duplex apartment offers bedroom with double bed and living room with kitchenette and sofa bed. The apartment is located in an ideal location in the quiet residential district of Zizkov, which has an unforgettable atmosphere. Wenceslas Square and the shopping street Na Prikopech are using public transport just a few minutes. 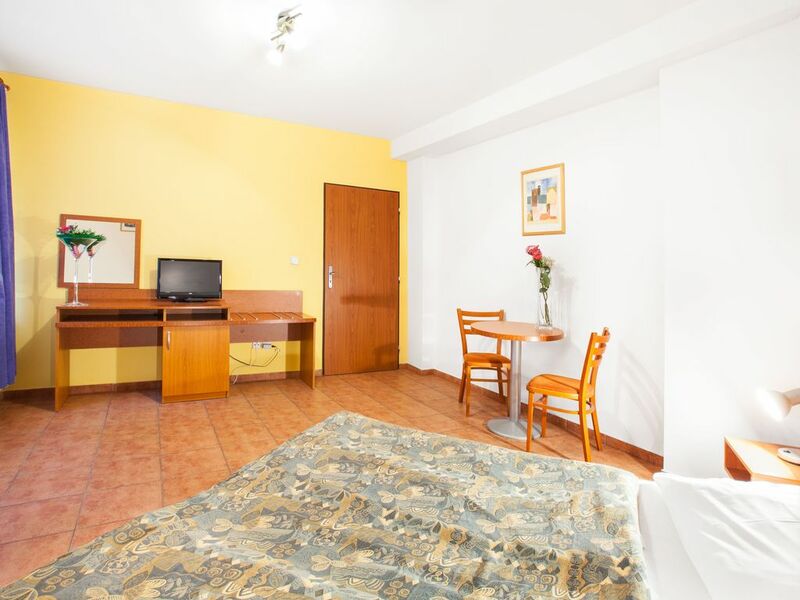 The apartment is comfortable equipped with modern facilities and offers excellent services: linen and towels, toiletries, Internet and cleaning are included in the price. In the direct vicinity you will find several restaurants, bars, shops, ATM as well as numerous cultural monuments and outdoor activities. Within 15 minutes walk you are in the heart of Prague where you can admire the rich history, among other Old Town Square, National Museum, and Wenceslas Square. Even the shopping lovers will not be bored by the variety of shops and boutiques. If you arrive by car you can park for extra fee on the guarded parking place from house. If you prefer to come by plane you can order for extra fee transport service. In this case indicate this in the booking. All in all, an excellent accommodation in a great location against an affordable price. Accueil peu professionnel. Chambre à l'étage très chaude en plein été. Ventilateur inefficace. Accueil peu professionnel. Chambre à l'étage très chaude en plein été. Ventilateur inefficace. Cuisine mal équipée. 3 verres pour 4 personnes. Pas de passoire. Ménage approximatif. Tramway pour le centre à proximité. Nettes, sauberes Appartement mit den Wichtigsten Dingen ausgestattet. Die Gastgeber sind sehr freundlich und hilfsbereit. Die Altstadt von Prag kann zu Fuß erreicht werden, dauert ca. 30 min. Ansonsten ist in unmittelbarer Nähe eine Bushaltestelle. Für ein paar Tage in Prag zu empfehlen. The host was very helpful and nice with arrival and providing information on how to get to old town attraction area. Апартаменты эконом класса, цена соответствует качеству. Из достоинств - хорошее место расположения (автобус 207 практически по всему центру, 3 остановки до автовокзала и метро, до центра 5-7 остановок). Порадовал дворик, можно после утомительного дня посидеть на свежем воздухе. Недостатки - номер был на двух этажах, по лестнице трудно подниматься, достаточно крутая (пожилым людям или с маленькими детьми точно не вариант), нет кондиционера, очень жарко на втором этаже. Общее впечатление - хорошо.